An American-born reporter for the London Sunday Times, Marie Colvin, along with a young French photographer, Remi Ochlik, were killed in Syria on Wednesday morning, according to several news reports. Colvin, one of the most celebrated war correspondents in the U.K., happened to be a guest on Anderson Cooper's CNN show just hours before her death. On the program, Colvin reported that a two-year-old baby had been killed in an attack on another home and she had witnessed the child die. "There's been constant shelling in the city," Colvin said. "So, Anderson, I have to say, it's just one of many stories ... It's chaos here." "Every civilian house on this street has been hit," she continued. "We're talking about--this is a very kind of poor popular neighborhood. The top floor of the building I'm in has been hit, in fact, totally destroyed. There are no military targets here. There is the Free Syrian Army. Heavily outnumbered and out-gunned." Colvin added: "It's a complete and utter lie they're only going after terrorists. The Syrian Army is simply shelling a city of cold, starving civilians." The two journalists were killed in a similar shelling on a makeshift media center where they were staying to cover the Homs battle. At least three other journalists, including Paul Conroy, a freelance photographer traveling with Colvin, were wounded. Their deaths come less than a week after Anthony Shadid, a Pulitzer Prize-winning New York Times reporter, died from an apparent asthma attack in Syria while covering the conflict there. Last week, Colvin mourned the death of Shadid. "Shocked by the news of the death of Anthony Shadid," she wrote. "A brilliant journalist and writer whose work glowed with his humanity and was always so kind and gentle. He will be so missed at a time when he was the best person to shed light on this strange new Middle East." Like Shadid, Colvin had secretly entered Syria. "I entered Homs on a smugglers' route, which I promised not to reveal, climbing over walls in the dark and slipping into muddy trenches," Colvin wrote in an article published by the Sunday Times on Feb. 19. "Arriving in the darkened city in the early hours, I was met by a welcoming party keen for foreign journalists to reveal the city's plight to the world. So desperate were they that they bundled me into an open truck and drove at speed with the headlights on, everyone standing in the back shouting 'Allahu akbar'—God is the greatest. Inevitably, the Syrian army opened fire." Like Shadid's death, Colvin's passing has led to an outpouring of remembrances from colleagues and fellow journalists. "Marie was an extraordinary figure in the life of The Sunday Times, driven by a passion to cover wars in the belief that what she did mattered," John Witherow, editor of the paper, wrote. "She believed profoundly that reporting could curtail the excesses of brutal regimes and make the international community take notice. Above all, as we saw in her powerful report last weekend, her thoughts were with the victims of violence. "Marie had fearlessly covered wars across the Middle East and south Asia for 25 years for The Sunday Times," Rupert Murdoch, News Corp. chairman and owner of the paper, said in a statement. "She put her life in danger on many occasions because she was driven by a determination that the misdeeds of tyrants and the suffering of the victims did not go unreported." "This morning I looked at the video of her body in a house in Homs. Her head down. Her voice silenced," wrote ITV's Bill Neely. "We are all the poorer for that. Bless you, Marie." According to Jean-Pierre Perrin, a journalist for the Paris-based Liberation newspaper who had been with Colvin in Homs last week, told London's Telegraph that Syrian forces had threatened to kill journalists there. "A few days ago we were advised to leave the city urgently and we were told: 'If they find you they will kill you,'" Perrin said. "I then left the city with the journalist from the Sunday Times but then she wanted to go back when she saw that the major offensive had not yet taken place." Perrin said he was told the Syrian Army "issued orders to 'kill any journalist that set foot on Syrian soil.'" 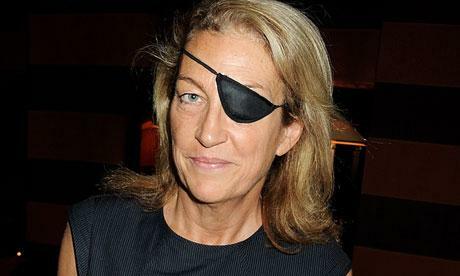 Colvin was known for her eye-patch, which she wore after losing sight in her left eye while reporting during an attack in Sri Lanka in 2001. Writing in the Times following that incident, Colvin vowed to continue reporting in war zones despite the risks. "So, was I stupid? Stupid I would feel writing a column about the dinner party I went to last night," she wrote. "Equally, I'd rather be in that middle ground between a desk job and getting shot--no offense to desk jobs." Watch Colvin's segment with Cooper below.